An exceptional selection of European paintings, spanning from the 14th to the 19th centuries will be offered in Sotheby’s Evening Sale of Master Paintings on 1 February 2018 in New York. The February sale features a rare and striking portrait of Cristoforo Segni, Maggiordomo to Pope Innocent X painted and signed by Velazquez and Cremonese painter Pietro Martire Neri Martire (estimate $3/4 million). Painted around 1650, during Velazquez’s second trip to Rome, the work is one of a series of portraits painted for the Court of Pope Innocent X on the occasion of his Jubilee, the most famous being Portrait of Innocent X (1650, Galleria Doria Pamphilij). Having remained hidden in the present collection since the mid -20 th century, the painting was recently featured in a dedicated exhibition to Velazquez at the Grand Palais, Paris in 2015. Velazquez’s highly expressive and distinctive brushwork is clearly evident in areas of the canvas, in particular the head of the sitter. A Wooded River Landscape with a Landing Stage, Boats, Various Figures and Village Beyond is a stunning work by 17 th -century Flemish master Jan Bruegel the Elder, and stands as one of the finest river landscapes by the artist in private hands (front page, middle, estimate $2.5/3.5 million). A primary example of his work on copper, the painting’s vibrant colors, intact glazes and thick impasto are evidence of its remarkable condition, and its meticulous attention to detail further contributes to the captivating jewel -like effect so prized in works by the major Flemish mas ter. and the Prisons of San Marco. While there are other known views of the Church of the Redentore by Canaletto, the present view of the Prisons of San Marco is a unique composition for the artist of which no other version is known. The sale includes a monumental painting by leading Italian Renaissance master Titian and his workshop. One of only two known versions of the subject by the artist, Saint Margaret Sotheby’s New York Evening auction of Master Paintings on 1 February 2018 will offer a monumental and striking painting by Titian and his workshop. One of only Titian, and Workshop two known versions of the subject by the artist, Saint Margaret (estimate $2/3 million) was first recorded in the English royal collection of King Charles I (1600 – 1649), where it was displayed alongside the King's most highly prized works at Whitehall Palace. The present work is being offered at a particularly poignant time, as the Royal Academy of Art’s upcoming exhibition Charles I: King and Collector (27 January – 15 April 2018) seeks to reunite the King’s treasures that were dispersed following his execution. During his reign, Charles I competed ferociously with the great powers of Europe to assemble an art collection rivaling to all others. Born into a family with deep ties to art, Charles I had an immense appreciation of art history and traveled across Europe to acquire works by some of the greatest artists, including Leonardo Da Vinci, Raphael and Correggio. It was in the Privy Lodging Rooms at Whitehall Palace – a series of private apartments – where Charles kept his most highly- prized paintings. 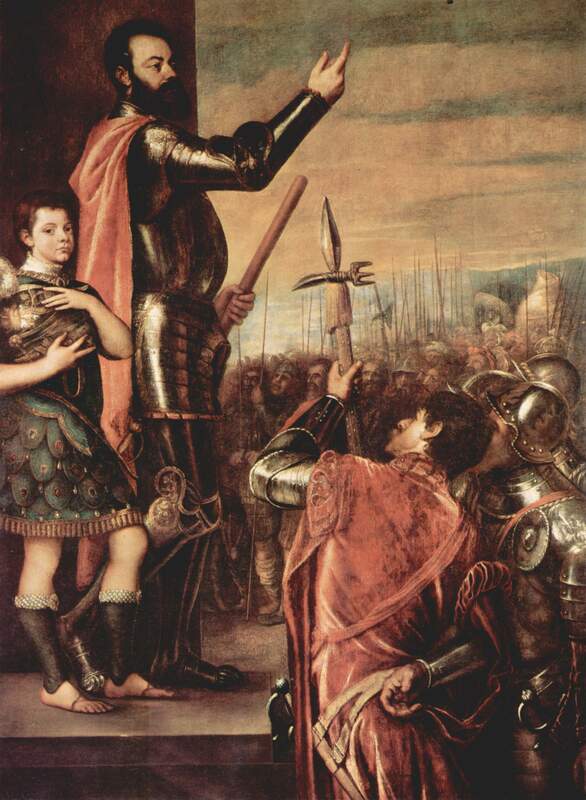 and Alonso de Avalos addressing his Troops (both Prado, Madrid), and three other remarkable works currently hanging at the Musée du Louvre, Paris. Salvator Mundi by Leonardo Da Vinci at £30. As one of two versions of the subject of Saint Margaret signed by Titian – the other being in the Museo del Prado, Madrid – it seems probable that the works were painted alongside one another , with Titian utilizing his workshop to block in areas of the painting and finishing the key areas himself. The expressive power of Titian’s later style is nowhere more clearly demonstrated than in the atmospheric depiction of the city of Venice on fire in the background. On the skyline, the campanile of St Mark glows in fiery orange and pinks, whilst the stormy waves of the sea are animated by dark blue and green brushstrokes. As is characteristic with Titian’s late works, the darker tones, fiery landscape and swift handling of the paint in the present work create a sense of drama that is entirely fitting to the narrative. Titian depicts the legendary virgin martyr, Saint Margaret, as she emerges unscathed from the body of Satan, who had appeared to her in the form of a dragon and swallowed her whole. The cross she held in her hand irritated the monster’s insides and the dragon burst open allowing her to escape unharmed. Painted in a myriad of colors, her luminous light green tunic with its bright white sleeves and rose pink veil stand out from the earthier, brown based tones of the rest of the canvas. The dragon that occupies the bottom register of the canvas is predominantly painted in brown and blackish hues and the only flashes of color are the strokes of red and white delineating his vicious mouth. Depicted in dramatic contrapposto, the implied movement in Saint Margaret’s twisting body contrasts to the solidarity of the rock behind her , emerging from the picture plane as an impressive figure, trampling the dragon underfoot and holding her crucifix aloft.